AFT Local 1493 hosted “Meet and Greet” gatherings at CSM and Cañada College in February to show appreciation for adjunct faculty and to provide a chance for part-time and full-time faculty to meet, get to know one another and discuss issues related to working at our colleges. Reports from those two events are on the next page. 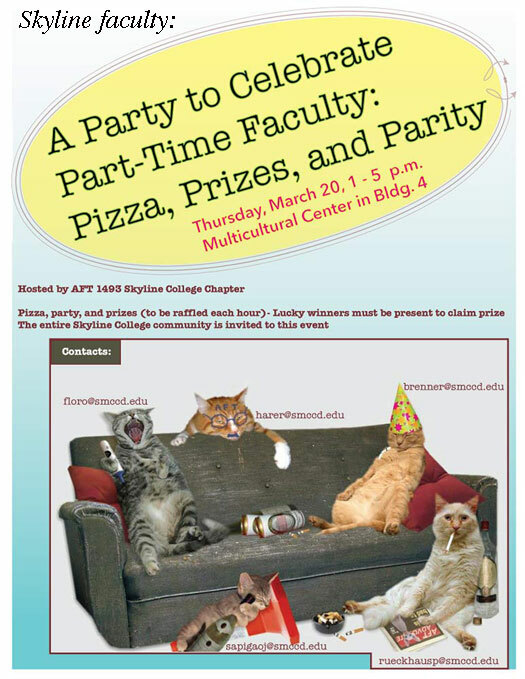 A third event–“A Party to Celebrate Part-Time Faculty: Pizza, Prizes & Parity”–will be held at Skyline College on Thursday, March 20. This event will be held from 1:00-5:00 pm. The Skyline College community is invited to join in showing their appreciation and support for adjunct faculty. Gift cards, donated by the Skyline College Bookstore, will be raffled each hour; lucky winners must be present to claim their prize. The Skyline AFT Chapter will raffle off five $10 gift cards (or ten $5 gift cards) every hour: 1:00, 2:00, 3:00, 4:00, 5:00. Skyline AFT 1493 Executive Committee members Katharine Harer, Nina L. Floro, Eric Brenner, Janice Sapigao, and Paul Rueckhaus are planning the event. On Monday, February 24, CSM AFT Executive Committee members, Teeka James, Anne Stafford, Lin Bowie, Sandi Dorsett, and Michelle Kern (designer of the wonderful flyer partially displayed below), hosted an Adjunct Faculty Appreciation Meet and Greet with Treats to show appreciation for adjunct faculty and to provide an opportunity for part-time and full-time faculty to meet and get to know one another. Part-time faculty came from a variety of disciplines: Fire Academy, ESL, Biology, Dance/PE, Business Technology, Physics, Speech, and Kinesiology. Full-time faculty and AFT provided pizza, cookies and fruit as the treats and those who attended shared information about themselves to help everyone get to know each other. Both part-time faculty who attended and those who sent regrets expressed their appreciation for the event. And both part-time and full-time faculty in attendance shared that they enjoy teaching at CSM more than at any of the other schools at which they have taught because of the classroom and office facilities available to all faculty and the friendly and helpful faculty members themselves. Those in attendance were also encouraged to share any questions or issues they had about teaching at CSM. One concern that the part-time faculty shared was a lack of good information about part-time faculty retirement plan options. During the discussions, Teeka James, President of our AFT local, came up with the idea for AFT to organize an Adjunct Faculty Retirement Workshop similar to those that are offered during the academic year for full-time faculty. Another important issue that was discussed concerned being asked to perform work (e.g. SLO work, meeting attendance) without compensation. AFT members explained that CA labor law requires being paid for all work done. It was pointed out that when a Dean asks a PT faculty member to do SLO or other extra work that an affirmative response should be contingent upon compensation at least at the Special Rate for all work done. Most Deans seem to find the necessary money, but usually only when asked. Concern was also expressed about the recent change in the photocopying policy. It is now much more difficult or impossible to make last minute copies of materials for classroom use. This especially has a negative impact on part-time faculty, who often are rushing from campus to campus, photocopying materials an needed. Cañada College AFT representatives held a Meet and Greet for adjunct faculty on Monday, March 10th, at the Cañada Vista clubhouse. The objective of this event was to give adjunct faculty a chance to meet their AFT representatives; ask their questions; present their concerns; and provide suggestions. Faculty who attended provided AFT representatives with insight into issues they are facing and expressed their appreciation for such an event as well as a desire for AFT to hold additional similar events. A gist of the meeting included topics like part-time parity; part-time representation on committees; compensation for tasks that extend beyond the classroom; clarity on college-wide policies (e.g., flex day compensation, methods for keeping records, and hiring and staffing processes); e-portfolios; recognition for contributions to their departments and the college; consideration for adjunct contracted responsibilities and time; leveled classes and repeatability of courses; and fair compensation for student-contact hours. 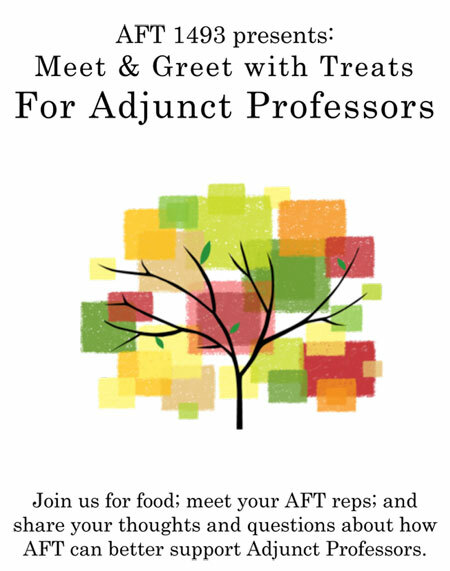 AFT is thankful to those faculty who were able to attend the Meet and Greet, for they helped start a cross-campus discussion of adjunct concerns. We hope that if you have a concern, you find the chance to let one of the AFT reps know, so we can help build a thriving and amiable working environment across campus. As AFT continues to advocate for increased part-time parity, your suggestions, concerns, and involvement are of vital importance to the negotiations team. Please contact: Victoria Clinton, Salumeh Eslamieh, Monica Malamud, Elizabeth Terzakis, or Lezlee Ware with your questions, concerns, and suggestions.